Is there such a thing as a perfect crime-fiction novel? Probably not, but if there were, this would surely be a strong contender. Arnaldur Indridason's latest novel in the Inspector Erlendur series continues the upward trend in quality, confidence and storytelling that I have come to hope for, even dare to expect, with each new outing. 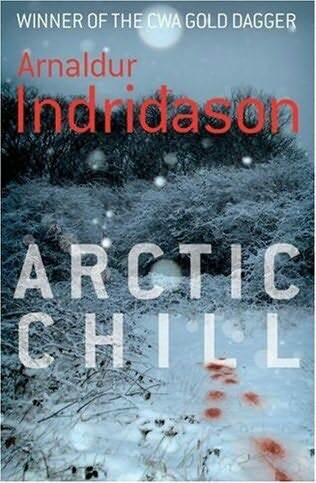 Tragically, Indridason's translator, Bernard Scudder died before he had completed work on ARCTIC CHILL, but Victoria Cribb has stepped in and the result seems to be a seamless one. The first few chapters of the book tell simply the story of a young Thai/Icelandic boy, Elias, found frozen in the snow, stabbed to death, a few yards from the block of flats that is his home. The police investigation continues, initially in a straightforward mode but gradually tightening its grip as icily as the climate, becoming colder and bleaker as the pages turn. The main plot of the book is the attempt by Erlendur and his team to find out who killed the boy (and why). Hampered by communication problems, the police have to interact with the boy's mother via an interpreter. As her story emerges, we see the loneliness and determination of this hard-working Thai woman, trying to make a life for herself and her two sons after being abandoned and divorced by her Icelandic husband. The break-up of the marriage meant that both boys had to attend a new school, and much of the core of the book concerns the attempts of the police to dig into the cliques and cultures there, where a few teachers are cooperative but the majority, and most of the students and their families, most definitely are not. At the same time, the police themselves are irritated by each other and by the people they have to investigate. In this book, we learn more about Erlendur: the life-changing event in his youth that made him turn to police work; the tragedy of his brother, who died in a blizzard when the boys were out together; and the life-long effects of this event on Erlendur, whose brother still accompanies him, years later, like an alter-ego. Erlendur's children, now grown up, appear to be more mature in this novel. Eva Lind in particular seems to have transcended some of her problems and attempts to connect with her morose father. Erlendur's past is also bought home to him by the terminal illness of his old boss Marion, and his knowledge that with her passing, much of his own history will have gone. These psychological elements do not slow the pace of the book. This author is brilliant at speaking to the reader at the level at which the reader desires, so one can either ignore the economically presented character studies and get on with the plot, or revel in them and find further insight behind the sparse prose. For me, this author understands internal suffering all too well, and can convey the sadness of daily life in a dispassionate yet empathetic way. Returning to the plot: a previous case involving a missing woman threads its way through the investigation of the dead schoolboy. Eventually, both cases are resolved in a way that is satisfying and, although sad, with some optimism for the family of the boy. I was moved by this book, all the more so for its unsentimental tone and its on-the-nail portrayal of depression.